Even with all of the technological advancements throughout various fields, human resources seems to be a sector that is being left behind. The entire process is completely determined by the HR manager's experience, and the search process is established upon his analysis of the job description. When there is automatic parsing, the keywords are extracted by the HR manager, otherwise, it is the same person who is scanning through the pile of resumes. It is not only problematic that we are placing so much trust in this person, but that as an organization, we are highly dependent on them. All the knowledge of the organization for hiring for any historical roles are lost with the leave of a hiring manager. Recruiters are being paid based on customer satisfaction, but will never receive feedback on exactly how exceptional hires differs from satisfactory ones. Our website HIREflection offers a BI (business intelligence) solution to some traditional HR problems. 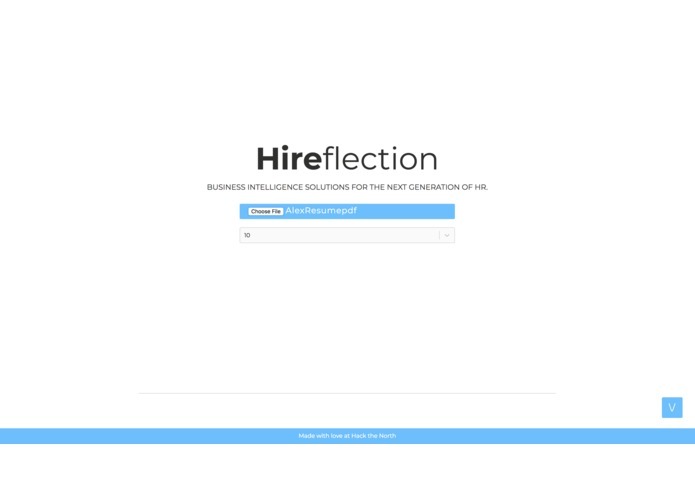 HIREflection supports the submission of the resume of employees, and their corresponding review by their manager as a number between 1-100. The user is able to choose between two types of searching. 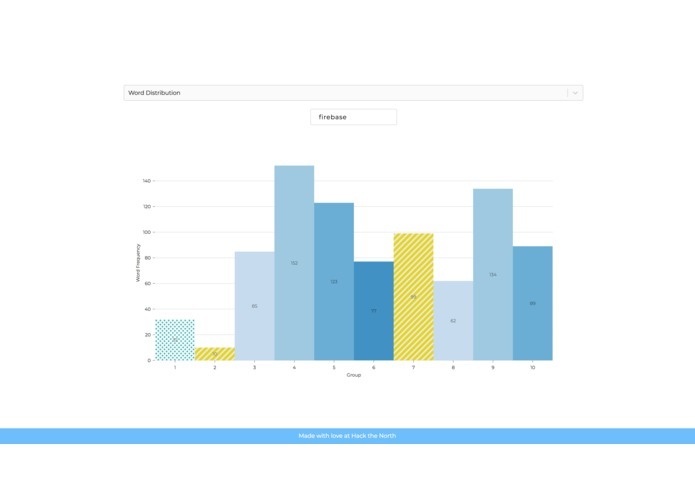 The first being keyword based, where the user inputs a keyword, and a bar graph corresponding to the frequency of 10 categories of employees is shown. 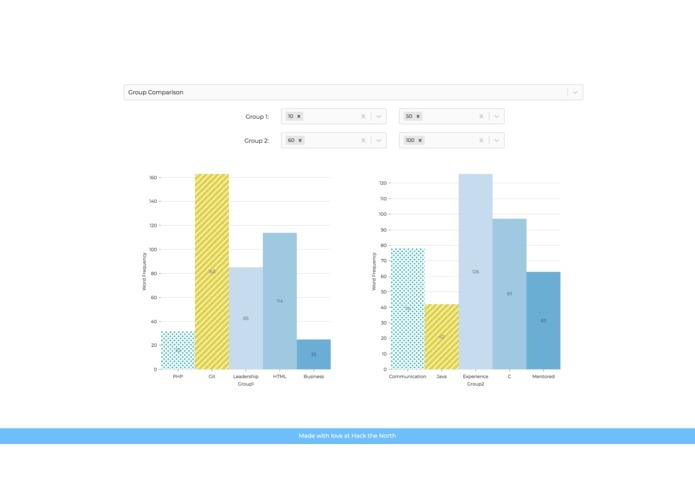 The second being based on the category of employees, the user submits two interested groups based on management's review, and the six most popular keywords of each group is shown with their frequency on a bar graph. Since the focus of HIREflection is on the data processing, it was a challenge for to acquire the keywords. It was difficult to go through two APIs without any previous experience. Due to the different components, it was also troublesome to manage the dependencies that were installed in various locations. For example, one set of node modules needed to be stored for the application server, whereas another for the web server. We are proud that we were able to address such a prevalent but unidentified problem in such a simple way. It is something that could be used by a large amount of organizations, and is highly scalable, seeing as the accuracy would only increase. We are also proud that we were able to integrate Express.js and React. We have never done this integration, and the merging conflicts were frustrating, but after completing the project, we could proudly say that we have passed this hurdle. To scale our application, it would require a database and queries to handle large datasets. The parsed information would also be labeled to allow for more varieties in HIREflection's data analytics and more informative graphs to be used. We would then move on to work with whole phrases instead of keywords, but that would require the implementation of AI. The returned relevancy score would also be used in the analytics.